Vidir Video | Donnegan Systems Inc.
Material handling solutions that optimize procedures, increase flexibility, and lower costs. storage space, and money- enabling a much more efficient workflow. For nearly 40 years, we’ve helped companies improve their storage, efficiency, and productivity. Our ergonomic and sturdy solutions help streamline any workforce. Donnegan Systems, Inc. offers material handling solutions that optimize procedures, increase flexibility, and lower costs. Our vertical storage solutions offer first-class, high-tech systems that enable a much more efficient workflow. Vertical storage lifts and carousels help to save valuable floor space while simultaneously keeping things off of the floor and allowing access to materials that is both efficient and ergonomic. These solutions deliver inventory to the operator at an ergonomic height, eliminating the need for ladders, forklifts, and other hazardous retrieval methods. 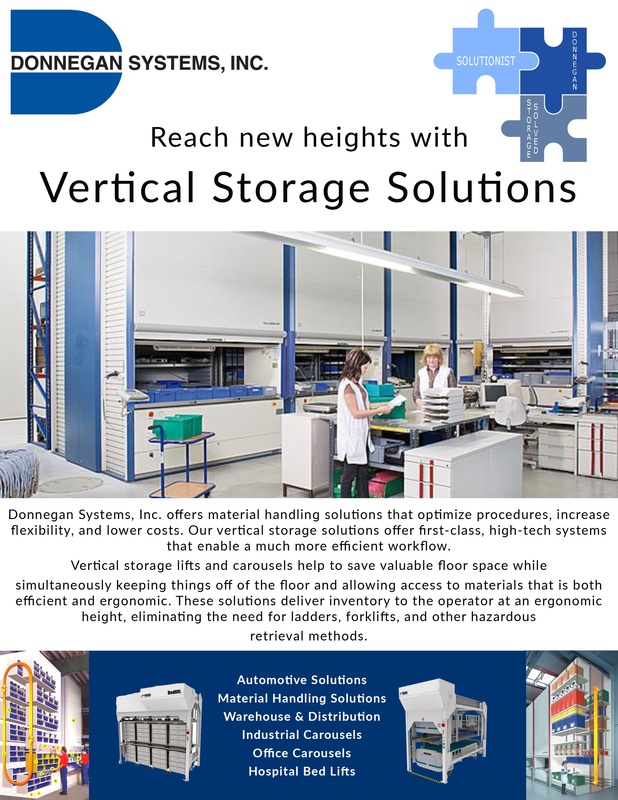 Download our info sheet to learn more about vertical storage solutions. You will receive a link to download this free case study, and your email will not be sold or shared. Donnegan Systems has helped companies across New England and Eastern NY. Let us show you how to look at space a whole new way. We pride ourselves on fast, friendly, and thorough service.